Studio B is a fine art photography and design studio that strives to capture the important stages of your life in the finest art and design. We offer in-studio and on-location photography for expecting parents, newborns, children, seniors, families, and weddings, events, and commerical. Art can be found anywhere and our portrait artists will embrace the unique qualities found at any location to create cutting edge portraits. 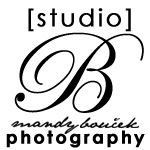 Mandy graduated from Bethany Lutheran College in Mankato, MN a with a BA in fine studio art in both photography and graphic design. Mandy's knowledge and experience in art history, design, and photography make for a strong combination that takes her photography to a fresh, modern, artistic and new level. Her graphic design background ensures that you will have a work of art.